“Reeled out with the chilling calmness of a Hitchcock film,Above haunts as it illuminates. Deftly told, this tale of human resilience in the face of madness is a horror classic for our times” (Lynn Cullen, bestselling author of Mrs. Poe). Blythe Hallowell is sixteen when she is abducted by a survivalist and locked away in an abandoned missile silo in Eudora, Kansas. At first, she focuses frantically on finding a way out, until the harrowing truth of her new existence settles in—the crushing loneliness, the terrifying madness of a captor who believes he is saving her from the end of the world, and the persistent temptation to give up. But nothing prepares Blythe for the burden of raising a child in confinement. Determined to give the boy everything she has lost, she pushes aside the truth about a world he may never see for a myth that just might give meaning to their lives below ground. 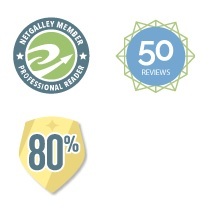 Years later, their lives are ambushed by an event at once promising and devastating. As Blythe’s dream of going home hangs in the balance, she faces the ultimate choice—between survival and freedom. 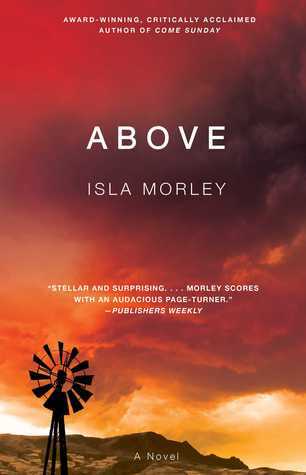 Above is a riveting tale of resilience in which “stunning” (Daily Beast) new literary voice Isla Morley compels us to imagine what we would do if everything we had ever known was taken away. Like the bestselling authors of Room and The Lovely Bones before her, Morley explores the unthinkable with haunting detail and tenderly depicts our boundless capacity for hope. I picked this book up on a whim last year and finally decided it was actually time to pick it up and read it. (2015 was a bad book buying year. As in, I bought all the books.) I thought the synopsis sounded super creepy and sometimes I like those stories, so here we are. The story takes place pretty much right when Blythe is taken by Dobbs. Morley doesn't really waste any time introducing us to Blythe's family, except through her memories. You can tell from the first few chapters that even though she's a teenage girl, Blythe is not going to be easy to handle. She fights Dobbs at every instance, plots his demise, and refuses to eat in just about every scene. I liked that a lot. I liked that she wasn't a damsel in distress even though she was a teenage girl. After that, Blythe is even more depressed and withdrawn so Dobbs...brings her a baby. I own't go into much detail about what happened with Charlie, but this part of the story really shows the damage that being taken has inflicted on Blythe. Eventually, Blythe gets pregnant again with her son Adam. It's then that she decides to make the most of her life, so Adam doesn't "miss out" on anything. It's interested to read how she changes and how much she loves her son, even though he's from Dobbs. Adam doesn't ever call Dobbs his father, though. He calls him "Mister" and I liked that. To me, it felt like a slap in the face to Dobbs. The book doesn't focus too much on Adam's childhood. It jumps to when he is fifteen and, without telling too much, he and Blythe escape from Dobbs. I thought it would be all sunshine and rainbows after this and that Blythe would be reunited with her family, since the synopsis said this book was similar to Room (which I hated). I was very, very wrong. What happens once they escape is a complete whirlwind! It turns out that Dobbs was kind of right about the end times and things Above are not like Blythe left them seventeen years ago. All that time she spent fighting Below doesn't stop once she and Adam are back on top. What I loved about this part (and all of the book, really) was that Blythe never really lost her hope. She was beaten down and depressed, but a part of her always knew she would get out; that she would eventually make it back home. I liked Blythe a lot. Adam was a strange bird, but I think that goes with growing up in a missile silo with no one to talk to but your mother. There are a few other characters that you meet in the Above part of the book, that you will learn to like also. This book definitely kept me intrigued and also left me wanted more.